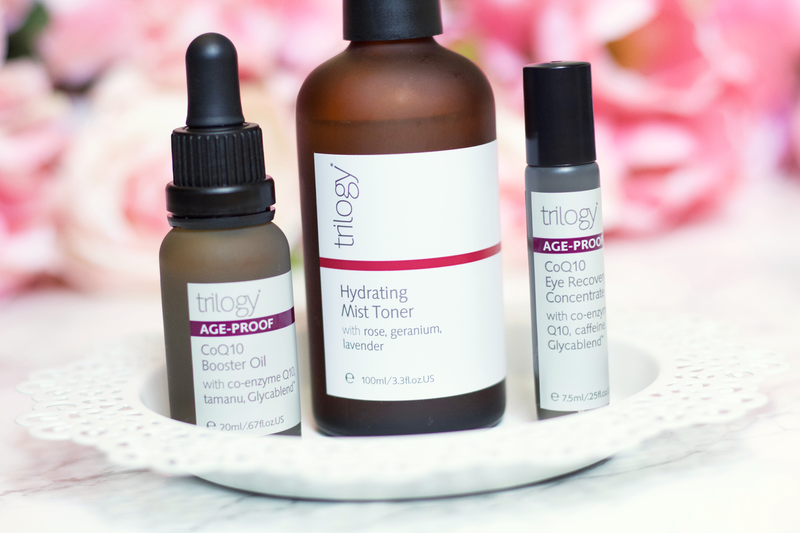 Trilogy is a skincare brand that is no stranger to the blogging realm. Using certified organic and natural ingredient skincare products, this Kiwi brand has been all over the blogspace for quite some time. 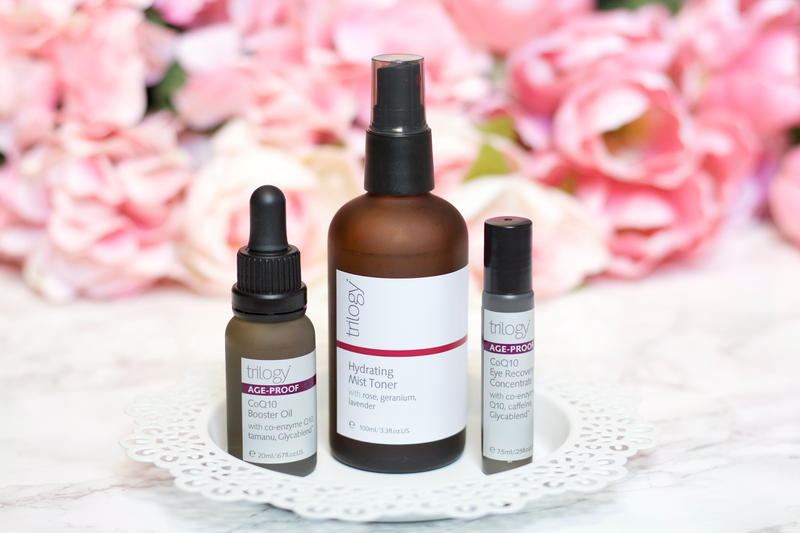 The abundant plant derived and lush pure seed oils, as well as their own trademarked components (such as their antioxidant Rosapene), mixed with other valuable skin nourishing ingredients make Trilogy a brand that is deserving of all the hype it gets. I'm pretty sure everybody has either heard of their popular Organic Rosehip Oil or currently own it/have owned it at some point. Although this product seems to be their main talking point, there are so many more from them that are of similar great quality. 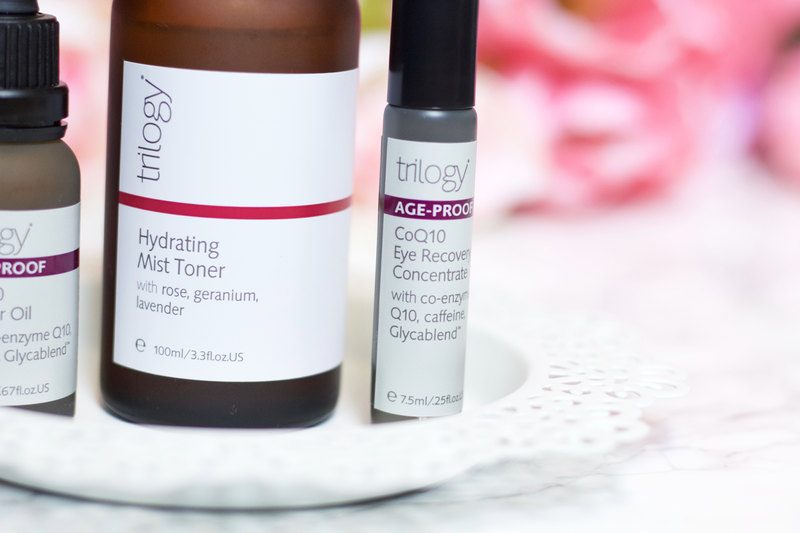 Three products that I think deserve some major recognition are their Hydrating Mist Toner, CoQ10 Booster Oil, and CoQ10 Eye Recovery Concentrate. The Hydrating Mist Toner* is a refreshing and moisturizing toner that is very cooling on the skin, and has a calming floral aromatic fragrance due to the lavender, rose, and geranium ingredients. It's targeted for any skin type that is needing hydration, while also promising to revitalize and uplift the skin. Due to lavender oil being a natural antiseptic, those who have similar troubled skin like mine would also benefit a lot using this product with it having such calming and healing properties. I have used this pretty much nonstop since I first got it delivered to me, and it's really calmed down my skin's redness and sensitivity. I've honestly drenched myself in this mist because I just can't get enough of it (no, this is not an exaggeration!). It's really so nice! I mostly enjoy using it at night since I do have sleeping problems and the calming fragrance really just puts my mind at ease. I have not delved into any aromatherapy treatments but after using this mist I'm really interested in trying some products, as the rose, lavender, and geranium are such a relaxing mix together. The mist does not put out too much product, which is great for controlling how much you want to use. I do notice that it is a bit sticky after using it, but it has not bothered me too much (do keep this in mind though if you are bothered by this kind of texture). I do think it has revitalized my skin and helped it, especially being part of my lengthy night routine where I like to use a lot of products that cater to special needs. I love that it has aloe vera in it as it provides such a lovely cooling sensation, it's great on nights when I use my AHAs/BHAs. Once I run out of this I definitely know I will be buying it myself! Full ingredient list (bolded is my commentary and ingredient qualities): Aqua (Water), Aloe Barbadensis (Aloe Vera) Leaf Juice (cooling, moisture balance, and soothing for sensitivity and irritation), Pelargonium Graveolens (Geranium) Oil (acne, inflamation), Rose Flower Oil (antiseptic, astringent), Lavandula Angustifolia (Lavender) Oil (natural antiseptic/healing and calming to skin), Caprylyl/Capryl Wheat Bran/Straw Glycosides (and) Aqua (and) Fusel Wheat Bran/Straw Glycosides (and) Polyglyceryl-5 Oleate (and) Sodium Glutamate (and) Glyceryl Caprylate, Dehydroacetic Acid (and) Benzyl Alcohol (gluten free ingredients, provide solubilisation of natural essential oils and water), Geraniol (organic compound, part of natural essential oils), Citronellol (organic compound, part of natural essential oils), Linalool (organic compound, part of natural essential oils). CoQ10 Booster Oil* is an organic oil blend that "recharges and revitalizes skin at a cellular level, boosting collagen and elastin production and protecting against free radical damage," using great ingredients like Tamanu, macadamia, black caraway seed oils, and antioxidant Coenzyme Q10 to "feed and renew skin." Also included is Glycablend, a mix of chia, blueberry, strawberry and pomegranate oils, which keeps the skin "supple and youthful." Basically... this oil ain't messing around. Coenzyme Q10 is natural antioxidant found in every cell in the body, and cells use it to produce the energy our body needs for cellular growth and preservation. It also strengthens and revitalizes skin cells by making them less vulnerable to sun damage. Our bodies produces less CoQ10 as we age, which makes our cells more susceptible to oxidative stress by free radicals (as CoQ10 provides a natural defense against it being an antioxidant). Along with this, the breakdown of structural protein collagen as we naturally age can be reduced by using CoQ10. By helping production of elastin, a protein also found in the dermis with collagen, the aging effects and continued reduced elasticity in the skin lessens. CoQ10 has been found to prevent cellular damage from UVA rays by being applied topically, acting as a barrier over the skin and a great supplement with sunscreen. Glycablend is a lush blend of pure seed oils made to fight glycation, a natural process which causes collagen and elastin to solidify and lose their suppleness due to glucose/fructose attaching themselves to the two proteins without an enzyme and rearranging their structure. The protein fibers can be reduced to breaking and become rigid as the glucose/fructose cross-link the amino acids present in the collagen and elastin in the dermis. At this point, regeneration of the skin has been halted and aging effects start to set in. Research has been done to note that it's not only high sugar intake that causes glycation, but it's also increased by UV light contact (therefore wear sunscreen!). Glycablend works to improve the skin's overall texture, minimizing fine lines, wrinkles, and restoring radiance. The oil really does work, I can tell how much extra help my skin has gotten by using it and especially the new softness my skin has gotten from it. As I'm at the age where I'm doing preventative anti-aging treatments, I can't speak for how it does in relation to any extreme aging side affects, but I have some fine lines on my forehead that have lessened a good amount by using this. The plump feeling of my skin and the softness, as well as increased radiance, have been just outstanding. I don't have much trouble with sagging skin, so I can't really comment on that for aging but I do feel like my skin is a bit more taut in some areas. I have not used an oil like this before, it's definitely been a sensory and relaxing experience. The smell is a bit strong, a herbal fragrance due to the pure seed oil mixture, but I really like it so much. This is an oil that I think with continued use is an important part of the skin routine, and skin health in general. It has such vital and natural ingredients that really do work, and do more than just provide great changes to your outward appearance. My only recommendation is not to use too much of this at one time. It is a very rich oil and especially if you have oily skin like me, 1-2 good sized drops should be just fine. Full ingredients: Macadamia Ternifolia (Macadamia) Seed Oil (antioxidant, moisturizing, anti-aging, anti-inflammitory), Simmondsia Chinensis (Jojoba) Seed Oil (acne, anti-aging, anti-inflammitory), Helianthus Annuus (sunflower) Seed Oil (repair skin barrier, anti-inflammitory), Salva Hispanica (Chia) Seed Oil (moisturizing, antioxidant), Nigella Sativa (Black Caraway) Seed Oil (antioxidant, restore moisture), Calophyllum Tacamahaca (Tamanu) Seed Oil (antioxidant/antibacterial), Ubiquinone (CoQ10), Euterpe Oleracea (Acai) Fruit Oil (And) Tocopherol (antioxidant phytosterol; encourages collagen production, skin regeneration process), Vaccinium Myrtillus (Blueberry) Seed Oil (skin renewal, averts glycation-induced skin damage), Fragaria Vesca (Strawberry) Seed Oil (anti-inflammitory, helps get rid of toxic waste in cells), Punica Granatum (Pomegranate) Seed Oil (anti-aging), Parfum (100% natural essential oil components), Citral (naturally occurring liquid in essential oils of plants), Geraniol (organic compound, part of natural essential oils), Citronellol (organic compound, part of natural essential oils), Limonene (naturally occurring chemical, part of natural essential oils), Linalool (organic compound, part of natural essential oils). CoQ10 Eye Recovery Concentrate* is a cooling liquid roller serum to treat and tone the under eye to brighten and increase firmness, as well as to reduce periocular fine lines and puffiness. It uses CoQ10 and Glycablend to create supple and youthful skin, and incorporates horse chestnut and green coffee for microcirculation to diminish dark circles. First thing I'll say is that I've never used an eye treatment product like this before where you have a roller applied for the under eye. It's such a great feeling for that area, as mine are often dry using retinol eye cream on/off in my night routine, and the cooling sensation from the roller makes the whole experience. It's easy and quick to use, and the product sinks in well as you work it into the area where its applied. You have to shake it a bit before every use (I didn't read the instructions first saying that, dumb me) and the liquid comes out well onto the ball for application. It did provide moisturizing benefits for me but the key things I saw it helped with was correcting the discoloration and puffiness in my under eye area. It also softened my under eye and after each use I could feel it gradually firming up the areas where I applied it, but not to the point where it dried me out or felt too much. The cooling effect of the liquid and roller together I think worked really well with controlling the puffiness of my under eyes. I also apply it on my upper eyelids as well, and have had no problem. It feels really nice to apply it there too! This is a great product if you're someone who needs a little help with your under eyes and also someone who might not have a lot of time on their hands. It's a fast step in the last stages of your routine, and due to its small size it also would be great for traveling with. It's packed with nourishing ingredients similar to the CoQ10 Booster Oil but also contains ingredients like hyaluronic acid, green tea, evening primrose, rosemary, and chamomile. It's fragrance-free so those who have a fragrance sensitivity would do well with using this product, too. I think any product from Trilogy that contains CoQ10 will be a favorite for me. Full ingredients: Aqua (Water), Cetearyl Olivate (and) Sorbitan Olivate (emulsifier, help soften and moisturize skin), Glycyrrhiza Glabra (Licorice) Root Extract (anti-inflammatory, brightening), Aesculus Hippocastanum (Horse Chestnut) Extract (helps reduce appearance dark circles and puffiness), Coffea Arabica (Green Coffee) Seed Extract (firming, nutrients to protect and liven up skin), Cucumis Sativus (Cucumber) Fruit Extract (calm irritated and stressed skin, cooling), Chamomilla Recutita (Chamomile) Flower Extract (anti-inflammatory, soothe irritated skin), Jojoba Esters (from jojoba oil, soften and reduce fine lines and wrinkles), Vaccinium Angustifolia (Blueberry) Seed Oil (skin renewal, averts glycation-induced skin damage), Fragaria Vesca (Strawberry) Seed Oil (anti-inflammitory, helps get rid of toxic waste in cells), Punica Granatum (Pomegranate) Seed Oil (anti-aging), Ubiquinone (CoQ10), Sodium Hyaluronate/Hyaluronic Acid (hydration, plumping skin, smoothing fine lines and wrinkles), Camellia Sinensis (Green Tea) Leaf Extract (antioxidant, protect skin from free radical damage, anti-aging, acne/troubled skin), Prunus Amygdalus Dulcis (Sweet Almond) Oil (regulate moisture levels and natural pH level of skin), Olea Europaea (Olive) Fruit Oil (soothe and nourish), Oenothera Biennis (Evening Primrose) Seed Oil (maintenance of epidermal skin cells, treats dry/damaged/dull skin/acne), Calendula Officinalis Flower Extract (and) Glycine Soja (Soybean) Oil (antiseptic, anti-inflammatory, soothing), Rosmarinus Officinalis (Rosemary) Leaf Extract (natural preservative, antibacterial, antioxidant), Glycerin (Vegetable; hydrates skin and barrier against moisture loss), Xanthan Gum (stabilization), Citric Acid (preservative, pH balancer, astringent), Dehydroacetic Acid (and) Benzyl Alcohol (naturally occurring preservatives). I hope this review might have helped some of you who were interested in these products! I'm really interested in trying out more from Trilogy. Let me know what your favorite products are from them! *PR gifted products. See my disclaimer for more information. Mika, this is such a beautiful and eloquent post. I have seen this brand foating around Instagram more so recently and actually tried a sample of their Organic Rose Hip oil in the past (definitely a great product). 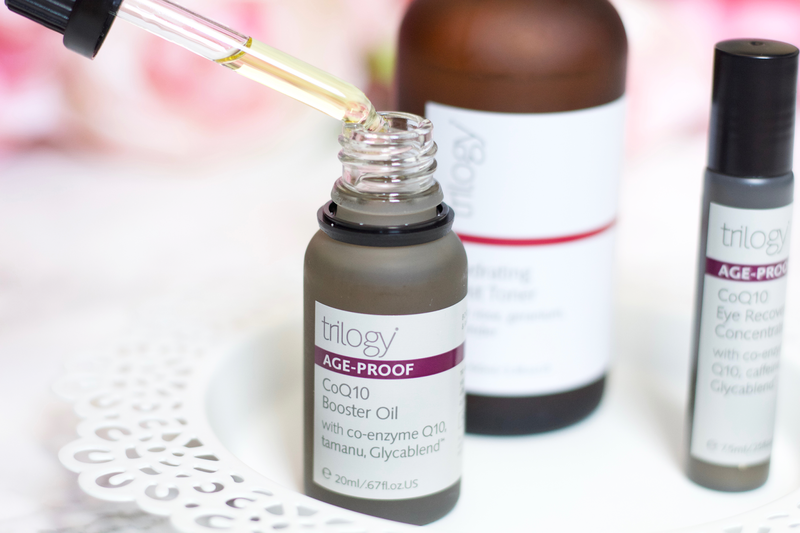 The toner and the booster oil have got my attention and I've added them to my list! Thank you for such a thorough and honest review!